We’ve never had a hard time explaining why Ben’s focus is a relevant overlay on our geographic focus in New York City. This has been a retail and commerce oriented city for well over a century. I’ve had a far more difficult time getting people to share our excitement in what we’ve long believed was a landscape perfectly suited to building a generation of industry-leading SaaS companies. Lately that’s gotten a fair bit easier, as the SaaS bandwagon nationally has gotten fairly crowded and folks in NYC have realized that we just might have something to offer to this market. But enterprise businesses still struggle for credibility here, so we set out to put a bit more of a spotlight on why we’re such believers in NYC SaaS. And frankly, when we dug into the data, even we were surprised by how compelling it is. 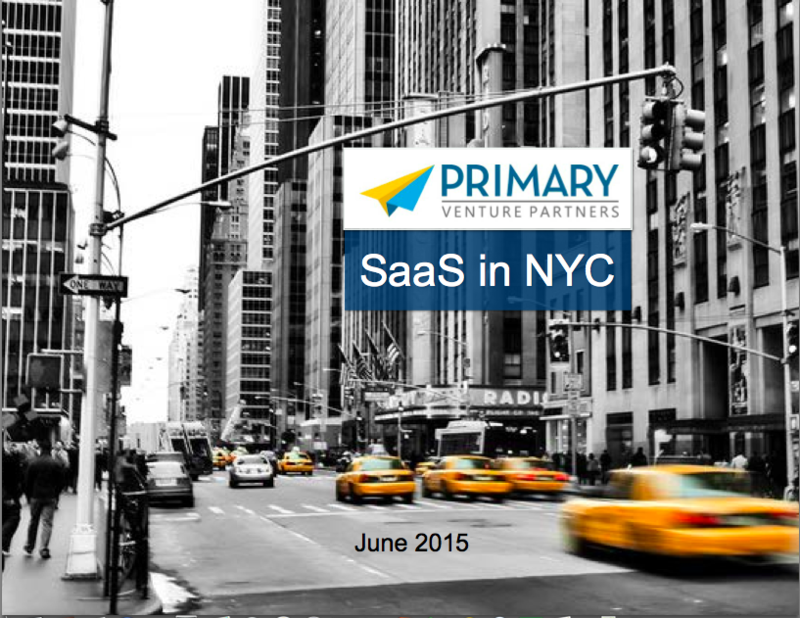 Click on the picture below to see our slideshow on the state of the NYC SaaS market. For an enterprise SaaS startup, hiring the right initial sales talent is a critical step. But that step is almost never the silver bullet that founders hope and expect. The reality is that building a sales organization is messy, takes time, and will forever require a ton of engagement from the founding team. In my experience, most early-stage companies hire Sales VPs WAY too early, and generally should wait 6-12 months longer than they think. I have four basic rules for how founders should think about building the early sales organization at a SaaS business: 1) Don’t hire too early; 2) Don’t hire too senior; 3) Take raw talent over industry relationships/experience; and 4) Don’t hire just one. 1. Don’t jump the gun. Salespeople are not miracle workers. You shouldn’t expect a salesperson to look at the product, look at the market, and then instantly start making sales. It’s the responsibility of the founders to the lay the groundwork by getting deeply involved at the customer level, and by intuition, skill, and force of will navigate to product-market fit and beyond. But most importantly, before you hand the reins over to someone else, you need to be sure you’ve achieved some early flavor of product-market fit. Not just one or two free customers, but real fit developed from dozens if not hundreds of conversations with would-be end customers. That volume of conversations ensures that you actually know what you need. It’s hard to hire a sales team when you don’t have any idea how they need to be selling. Spending adequate time in the market ensures that you optimize your hiring for the right sales skills. Bottom line: Founders must prove the path to true product-market fit; then hire salespeople to optimize, systematize, and scale that process. Never hire a salesperson with the intention that they’ll make your first sales. And when you have made that hire, founders must remain deep, deep in the sales process. For most great software companies, a founder is the best salesperson well into the eight-figure revenue days, if not forever! 2. Hire closers, not managers. Most founders naturally think that their first sales hire should be a VP Sales. Or an SVP, or God forbid a CRO. That’s almost never the case. What you need in your first hire/s are creative closers. You need to find those resources that are experienced and proven enough that you can trust they’ll be able to do the hard work of constantly tuning, reevaluating, and tweaking the sales messaging based on the data they see from their existing efforts. Really junior folks are rarely good enough to come into a new environment and get this right. But you need to be just as careful not to go too senior. Great sales VPs at scale are terrific because they’re great managers of people, they’re exceptionally metrics-driven, and they’re process fiends. They know how to drive a team and deliver results through the work of their salespeople. The problem is, they’re rarely closing a lot of business themselves. Your first couple of salespeople don’t need to be process fiends or people managers. You need creative, hustling closers, like a rising star Director of Sales. Someone who is coming from a place where they had an individual quota. As a bonus, that person has some management experience and may be able to help build and lead a team, but I never optimize for that at the earliest stages. This is not the time to optimize for sales leadership. It’s the time for execution and closing. 3. Prioritize talent over relationships. Most founders very naturally look for people from within the industry they’re selling into when they look for early sales talent. They want that Rolodex of preexisting relationships – it naturally gives the founder confidence that this new hire will leverage her network to make quick sales. Experience is certainly attractive, but it’s far more important that you hire a first-round draft pick than prioritize domain expertise and end up with a seasoned but possibly tired journeyman. If someone has the skills, they will be able to learn the ropes of the industry. Remember that exactly what you’re selling and who you’re selling it to is all but guaranteed to change. Over-optimize for what you think you need early on and you may regret it when that inevitably changes. Raw talent wins in the long term. In these early days you need a five-tool player who can handle everything — including messaging, identification of target personas, lead generation, relationship development, and closing. Creativity, scrappiness and flexibility are critical. 4. When you do hire, hire at least 2. Finally, don’t hire just one individual. Having only one salesperson leads to too many false positives or negatives. It also means that if the person doesn’t work out, you may need to put your entire sales operation on hold to find and train someone new. Hire two and see what happens. You’ll get the opportunity to observe and learn from what will inevitably be two slightly different models and styles, and natural competitiveness will likely drive them both to perform better. This also acknowledges the reality that one of them probably isn’t going to work out – sales hiring is always a 50/50 bet at this stage, after all. So don’t put yourself in the position of being left with nobody. In the coming weeks, I’ll share some more concrete examples that bring each of these rules to life. Check back for more and good luck with building your first sales process and team. In the meantime, share any questions or experiences in the comments! A few years ago I had the pleasure of attending the wedding of my good friend Bob, where I sat next to another good friend, Ashley, who had actually introduced Bob to the woman he was now marrying. It’s always a joy to watch good friends consummate the relationship they’ve chosen for the rest of their life, but I was struck in this instance by how powerful the experience was for Ashley and her husband, who had taken matchmaker to the ultimate level of success. Their joy watching this union formed was exponentially greater for the satisfaction of having played a foundational role in it. And now, as Bob and his wife have gone on to start a wonderful family, Ashley will forever feel a sense of pride and satisfaction watching a family that might never have been but for her thoughtful introduction way back when. I’ve never had the pleasure of playing that role in a marriage, but I’ve been enjoying a comparable feeling of satisfaction recently as we’ve celebrated a very successful new financing milestone last week for one of our portfolio companies, Reonomy. My friend and fellow board member Josh Guttman wrote a nice piece about the financing last week, and the RealDeal also profiled the company and deal. For me and High Peaks, though, the Reonomy story goes back 15 years to the summer of 2000, when Reonomy co-founder Rich Sarkis was a rising senior at Williams College, my alma mater, and I was a newbie VC. As I continue to do today, I try to meet with any Williams students who are starting companies or pursuing otherwise entrepreneurial endeavors. I met Rich then as he was a senior, working with a few friends on a very innovative, perhaps a bit ahead-of-its-time company called Bookbundle.com. Bookbundle was something of a Chegg predecessor, aiming at helping offset the outrageously escalating cost of textbooks for college students. While I didn’t think the business was quite investment-worthy at the time, I was taken by Rich’s precociousness as an entrepreneur and his raw horsepower as a thinker and strategist. And we hit it off pretty well personally, too. The business ended up doing fairly well, and more importantly, over the course of a 3+ year run it gave Rich a heck of an education in entrepreneurship. We stayed very loosely in touch but reconnected more substantively in 2008 when I was working on High Peaks’ foray into the educational content world via our investment in Flat World Knowledge. Rich was at the time a rapidly rising consultant at McKinsey in NYC, and we met for breakfast so that I might run some of our thinking about the textbook industry past him. Not surprisingly, Rich impressed the heck out of me again, and we mutually committed to staying in better touch. While he was having tremendous success at McKinsey, it was clear that eventually Rich was going to return to his entrepreneurial roots, and when he did, I wanted to make sure I had the chance to work with him on whatever he pursued. Fast forward to 2012. I had spent a fair bit of time with Charlie Oshman, a brilliant young founder who had been rattling about the commercial real estate tech space for awhile, working on a variety of ideas. I had always been impressed with Charlie and his knowledge of the marketplace, and he was a guy I knew I’d enjoy working with. At the time, though, it was clear to both of us that he hadn’t quite yet found the right product or market opportunity. But I was enough of a believer in Charlie and the macro-themes he was most focused on – the extreme opacity of data and information in the commercial real estate investment market – that I wanted to stick around and try to help him. So we had a months long dialogue through which Charlie’s thinking continued to evolve and my respect for him grew. And then one morning Rich and I were having breakfast at our usual spot, Norma’s, near the McKinsey office (home of the world’s best bagel & lox presentation, btw), and he said he had decided it was time to leave McKinsey. He wasn’t sure yet what he wanted to do, but he wanted to start something or join something very early stage and he wanted to get my advice on how he was thinking about things. Rich had been doing a bunch of work at McKinsey with large companies in the finance and financial information space, and by the end of the breakfast I had told him I was going to introduce him to this brilliant young entrepreneur who is close to hitting on something, but just needs a bit more help. It was a long shot, but I knew that at the very least Rich would enjoy thinking about Charlie’s business ideas, and that both of them would likely learn something from the discussions. Amazingly, sparks flew, and four months later High Peaks co-led a seed financing in Reonomy, the company that Rich and Charlie co-founded. A year ago Softbank joined us when Josh led a Series A, and last week, on the heels of truly exceptional 2014 product development work and early sales successes, Bain Capital decided to join us. People sometimes chuckle at the non-stop string of breakfasts, lunches and drink meetings that comprise much of the life of a VC. In some cases, that chuckling is very much warranted. But we do it for just this sort of reason – putting yourself in the flow of people and ideas so that once in awhile you can be there when sparks fly. Or better yet, be a catalyst for those sparks. We spend so much of our lives as VCs responding to inbound opportunities and deal flow…it’s a unique pleasure to actually have a hand in that creation, and it often leads to relationships that are deeper, more unique, and more powerful. That’s certainly true in this case. Reonomy is today the clear leader in its market and one of the best-funded commercial real estate tech startups on the planet. As I sit and watch Rich and Charlie build this special thing that they’re building, I can’t help but think back to that wedding and enjoy knowing that in a different context, I now understand just what Ashley was feeling. As Reonomy continues to grow, to employ more people, and to impact the CRE market in ever-expanding ways, it will be forever gratifying to know that we initiated the connection that made it all possible. We’ve changed a lot of things at High Peaks over the past few years – new people, expanded resources, and a focused strategy for supporting our portfolio. But perhaps most importantly, we’ve gotten very focused and disciplined around the sorts of startups we invest in. Sector-wise, I’ve long been a SaaS-focused investor, and have been religious about sticking to just that over the past 4 years. When Ben joined me in 2012, we added ecommerce and ecomm infrastructure to the mix, as that’s another NYC strength, and is what Ben knows best. So today, if it doesn’t fit into one of those two buckets, we won’t touch it. That focus has made us dramatically more efficient and effective, and we’re sticking to it. Stage-wise, we are singularly focused on seed and ‘early A’ investment opportunities – generally $1-3MM rounds at <$10MM valuations. We like to engage early in a company’s life, at the point where the initial team has been put together, the strategy is clear, but usually before product-market fit has been established. Given the relatively small checks we write ($100K to $1MM initial investments), this stage also enables us to take more of a leadership role in financings and get meaningful ownership positions. Additionally, our entire portfolio support strategy – in particular our talent program and Operating Partner Network – is built around working with companies at this stage. We frequently lead deals, and always actively engage with our companies, ensuring that our portfolio support resources can be fully brought to bear to help those companies grow. So while we see lots of $4MM+ Series A opportunities with great teams in exciting markets, we’ve become religious about passing on them. We believe passionately in the value of living by our rules. We preach focus to our companies, and live up to the same standards. Seed deals in our target sectors are what we’re tooled up to do, so we stick to it. Jet was co-founded by what we firmly believe to be the best startup ecommerce team in the country right now: Quidsi co-founder Marc Lore and his Quidsi colleagues Nate Faust and Mike Hanrahan. These guys have done it before, building a $550MM winner that was acquired by Amazon in 2010, and the band is back together now with their sights set on even greater things. So, why would we stray from our strategy and go after something like this, where we’ll have a tiny ownership position and limited engagement with the company? In this case, it came down to two things – ROI and education. We think Jet has potential to be the single most important ecommerce company started during the life of our fund. This is as good a team as you’ll see, and they are taking a swing at an enormous opportunity. That led us to see huge ROI potential despite the aggressive initial deal structure. From an ROI standpoint, the chance to invest in Marc getting the band back together is an opportunity you simply have to pay attention to. We’re going to learn a ton from the experience. As investors in the company we’ll have an inside view as Jet grows and develops. Ben will be working with some of the most talented and innovative practitioners in the ecomm sector as they build a revolutionary business. The insights and perspective that we gain will be invaluable as we work with other companies. So yeah, we’ve got rules. We care a lot about them and following them keeps us focused, disciplined and even smarter about our target sectors. But once in awhile – maybe a couple of times over the life of a fund – something comes along that is so compelling we’ll step outside those rules. That will almost always be about people, as it was in this case. We’re looking forward to the Jet journey, and trust us when we say that as consumers you should be too. Stay tuned… 2015 is going to be an exciting year in the world of ecommerce! Six months ago, we launched a major experiment when we formalized the creation of the High Peaks Talent Program, bringing Adam Redlich on board to lead our efforts at addressing the #1 challenge on the minds of almost every startup CEO – talent acquisition and team-building. Next week marks Adam’s ½ year anniversary, so we figured it would be a good time to check in on his progress against what we set out to achieve. We started from a belief that recruiting support is something that VCs do either (a) not at all, (b) opportunistically, driven solely by GP networks, or (c) underwhelmingly via some in-house resources. There are a very, very small handful of exceptions that are truly high impact, and strategically designed to deliver repeatable success – Greylock and OpenView we’ve witnessed at close range, and they deliver. There are a couple others we’ve heard rave reviews about. But the rest seem to have only limited success, and it’s opportunistic rather than reliable and repeatable. And they generally focus purely on sourcing talent, not on broadly impacting a company’s full recruiting operations. When Ben and I decided to get into the recruiting business, we agreed to the same rule we apply to everything we build into our strategy: we’ll only do it if we believe it will have a powerful and measurable impact on our portfolio companies. We’ve got very scarce resources at our small fund’s management company, so we can’t afford to spend time or money on incremental improvements – we need to pick the handful of things that are going to be really impactful and go all-in on them. As I wrote when we launched the program, we took a unique approach. We did not attempt to address every company right out of the gates – that’s a losing proposition. We took a curated, high touch approach, focusing first on just a handful of companies, and growing from there. We focused from the start not only on helping companies source talent, but also on ensuring that their recruiting practices and processes improved materially. We wanted to make sure that when they sourced great talent at the top of the funnel they were then able to close it. This, we anticipated, would be dependent on getting our talent resources embedded in our portfolio companies – forming deep partnerships, not just transactional vendor relationships. So now, 180 days in, how are we doing? So far, we give ourself a B. Adam has been fantastic, and he’s done exactly what we hoped he would. Not only has he sourced and helped close a whole bunch of terrific talent, he’s made the companies he’s worked with much, much better at recruiting. He’s shared his point of view on recruiting best practices and has helped improve their processes, from interview process development, to interview assessment and feedback best practices, to behavior based interview training, and systems and tool implementation. And he’s impacted not just the five companies he’s focused on, but also advised and consulted more broadly across the portfolio. As for the hard metrics, Adam has produced better than we hoped. He’s recruited 15 high quality hires in the past 6 months across the five companies he works with. Add to that three currently outstanding offers and it seems safe to say he’ll hit 17 or 18 by this weekend. That’s one hire every 10 calendar days from the day the program launched – a rate that is well beyond the expectations of a senior recruiter who’s already well up and running at Google (where Adam formerly ran northeast US tech recruiting). This hiring hasn’t just been quantity, it’s been quality. Adam’s companies have seen only one declined offer on his watch – a sign that the right candidates are getting through the process, and the process is leading them to be excited by the opportunity. Perhaps the most interesting metric we’re excited by – and one we did not expect at all – is Adam’s performance on outreach response rate. Recruiters often track the rate at which “passive candidates”, i.e. candidates who are not actively looking for a job, but who the recruiter contacts proactively, respond to this cold outreach. In Adam’s history, he’s experienced two realities on response rate. When he was at a couple of very successful but not household name growth companies, he would generally get 8-9% response, which is typical in the industry. Pretty low, but not surprising given the not-too-exciting messaging, “Hi, I’m recruiting software developers for XYZ company you’ve probably never heard of. Give me a call back.” At Google, which one might reasonably expect to get about as strong a response as anyone, he saw outreach response of 18%. Twice the generic company rate, but still not great. Now, through 6 months of calling as the Talent Partner at High Peaks, Adam’s response rate is over 35%. And this in arguably the most competitive hiring climate since the late 90’s bubble – with top SW developers getting calls every single day from recruiters. We thought Adam would have an advantage by being able to play the role of both VC and portfolio company talent manager, but we had no idea he’d have this level of advantage. Why is this? First, Adam starts with the deep understanding he gets as an insider at these companies, which leads to smarter outreach. Then because he’s recruiting on behalf of a portfolio of interesting opportunities, his initial outreach can be that much more tantalizing. It turns out, according to Adam, that developers are just way more likely to return a VC’s call than a recruiter’s. What this adds up to is a candidate sourcing mechanism that is 2x as effective as Google’s and more than 4x as effective as the growth companies he’s recruited for. Combine it with the genuine insider’s view of his clients’ culture that comes from living in their offices every week, and you’ve got a sourcing machine that produces both better quantity but also screens that quantity more effectively, enabling portfolio company managers to spend their time only with the most qualified candidates. That is the sort of unfair advantage that any company would kill for. Adam has also had the incentive and ability to impact the broader portfolio, too. He regularly takes interesting candidates that aren’t a good fit for any of his five core clients and passes them on. And he has jumped in on a number of occasions to advise and counsel other portfolio companies on their hiring practices. For example, he recently worked with a CTO to help strategize on the positioning of and sourcing strategy for a critical mobile developer hire. This Fall, he will be teaching a set of recruiting best practices classes to the whole portfolio. So while we’re excited by the results thus far, we give ourselves a ‘B’ because we think we’ve only scratched the surface of the program’s potential. Adam’s early successes have given us some insights and ideas that we think will enable us to expand his impact even further. We’re working now on a few new strategy tricks that we think could improve our sourcing capabilities dramatically further. And, as anticipated, we’re going to start growing the program. This will happen both in breadth, as we add to Adam’s team so that we can support more companies in the same way, and in depth, as a couple of Adam’s companies add full time junior recruiters who will work under Adam’s direction on an even more focused basis. In late 2013, we announced our Operating Partner Network (OPN), which we launched internally in Q1 2013. The OPN is a group of expert operators who we connect with our portfolio companies to address specific tactical challenges that, frankly, VCs just aren’t equipped to help on. Tired of sitting around board tables listening to investors offer detailed advice on tactical stuff they didn’t really understand, we decided to build a better mousetrap to address those very real challenges. OPN members are senior team members at leading NYC companies like SinglePlatform, StackExchange, Fab, Quidsi and Medidata Solutions, to name a few. With a year of the program under our belt, we wanted to take a look back at how impactful (or not) we have been. While we haven’t been perfect, so far it’s been a great success. Since launching the program, OPN members have touched nearly every one of our companies, and most High Peaks companies now have an ongoing relationship with one or more of them. We were even lucky enough to recruit one OPN member to join us here at High Peaks when Akshay Navle joined our team as a Venture Partner last fall. As with most things, those who have gotten the most out of the OPN are those who have dug in the hardest. One of the most successful leveragers of the network has been FieldLens, a NYC-based mobile platform for the construction industry. The OPN has had a material impact on their business on several fronts, and I know FieldLens CEO Doug Chambers would back me up when I say that the impact these resources played had no small role in helping his team build to the point where he landed the unsolicited term sheet that led to the $8MM Series A Doug closed last week. When Doug was wrestling with initial go-to-market strategy after successfully beta launching the product, we connected him w/ a SW marketing guru who’s launched dozens of products and who dug in and led the team through everything from customer segmentation and messaging to writing the spec for the initial VP Sales hire. An OPN member led a Customer Success workshop last fall and later, when the FieldLens team began straining under the support weight of their early customer success, this Success ninja dove in and helped them think through establishing customer onboarding and ongoing customer success practices. As inbound leads to the sales team exploded, we connected the guys to the architect of one of the more unique and efficiently operating sales machines in NYC, and he’s been actively advising on high volume lead management since. With a product of ever-increasing complexity, Doug’s uber-talented and industry expert VP Product Julian Clayton recently needed help thinking through the evolution of his product management practices. Enter Ron Vogl, a former OPN member and now VP Product at our portfolio company Handshake. In an interesting roundabout story that Doug highlights here, Ron has jumped in and had a big impact on Julian and the FieldLens product practices. And finally, when we needed a talented outside director to add to the board of this exciting young vertical SaaS business, we turned to OPN member Glen de Vries, Co-Founder and President of Medidata, which just happens to be one of the most successful vertical SaaS companies in the world. FieldLens is just one of a couple dozen companies in our portfolio, but fortunately it’s not alone in having reaped these sorts of benefits from the incredible talent that we’re lucky enough to be associated with via our OPN. This all goes back to what I laid out last year when we started talking about practicing better startup medicine. We are not the ultimate fix-it guys, or the oracle with all the answers. We are guys who try our best to help you understand the right questions to be asking, to understand the underlying challenges you face. And then we go out and help you find the best folks in the community to answer those questions. So far, we feel pretty good about our efforts. But we’ve got a long way to go and a lot of ideas we haven’t had a chance to effect yet. Stay tuned. We’ve written in the past about our ongoing focus on building assets and resources that will have material operational impact on our portfolio companies. We think that’s our job as investors in and partners with the founders we back. Picking winners is the easy part – helping them win is where we can have a truly differentiated impact. Since Ben and I formed this partnership a year and a half ago, we’ve been working our butts off to put our money where our mouth is on this front. We announced late last year a first piece of our operational platform, the Operating Partner Network. Today we’re very excited to announce another piece of the puzzle: our Talent Program, and a new member of the High Peaks team: Adam Redlich, our Talent Partner. Adam is a startup recruiting veteran. In addition to running the recruiting practices at three high-growth startups, he also led Northeast tech recruiting for Google, hiring hundreds of engineers for their NYC, Boston, Pittsburgh and Waterloo, Ontario offices. He’s hired over a thousand engineers in his day and has the breadth of skills to attract business side folks and C-level executives as well. He’s studied and developed a point of view on the best practices of the recruiting function through tours at staffing firms, Google, and in-house at a handful of smaller tech companies. Suffice it to say, he’s seen pretty much every angle on the recruiting game. We feel blessed to have him and are excited to watch him help our companies grow. So how’s he going to work? We’ve studied the recruiting models of a bunch of venture firms – talent programs are understandably in vogue at larger firms these days – and we’ve been largely uninspired by what we’ve seen. The typical model of hiring a single resource to ‘serve’ a large portfolio ends up being pretty low impact in the eyes of founders and CEOs we’ve spoken with. That’s hardly surprising when you imagine the life of a single recruiter trying to support 30, 40, 50 or more companies. The venture firms who are having real impact on recruiting are doing so by throwing lots of resources at the problem. Notable amongst these are Andreessen Horowitz in the Valley and OpenView in Boston. The recruiter-to-company ratio is the key, we think. Lots of resources and a heavy investment in connecting with and understanding the needs of their portfolio companies leads to real results. Effective hiring will often be the single biggest determining factor driving success or failure of an early stage company. These are small teams for whom recruiting is never a core competence. Some teams might be lucky enough to have good networks to help them source candidates but they can’t spend enough time nurturing them. Even companies that are decent at sourcing aren’t good at the critical but underappreciated process management side of recruiting. How do you make sure that when you’ve managed to source that dream candidate you run a process that both identifies her and makes her want to work for you? While they need more help, they’re simply too small to hire a full time resource (~50-75 employees seems to be the breakpoint for that). So where do they turn? Generally they go it alone and hope to get lucky and/or work with transaction-oriented contingent search firms who might help with the sourcing part, but not the process part. Some end up doing OK, but most end up pulling their hair out and throwing too much money at outsourced recruiters. We believe that a focused, dedicated resource is the only good answer. You need someone who will actually come to understand the companies, who will be an informed and insightful sourcer, and who will educate management teams on optimal process. We’ve found a way to make that capability affordable to companies who are at only 10 or 20 employees – maybe a year or two before they’d be ready to hire someone full time. The model Adam is now building is a high touch, shared resource model. The companies will pay for it on an entirely opt-in basis, so those companies that choose to participate will really focus on it. And given the skills of a guy like Adam, we think they’ll be getting a screaming bargain. We’ll match all-star recruiters with portfolio companies on a 5-to-1 ratio, building an expanding team of recruiters over time. Those recruiters, like our portfolio, will be geography and sector focused, increasing the efficiency and effectiveness of our efforts. And they won’t sit in our office, they’ll live in the offices of their ‘clients’, coming to deeply understand the cultures of and hiring managers at those companies. We start with Adam and five lucky SaaS companies, and as the model is proven out Adam will add talent experts to his team, each of whom will serve five more companies. We’ve been up and running now with Adam for a few weeks, and if the early returns from his clients are any indication, we’re onto something. He’s fast at work helping source key hires but also working with those companies to implement world-class recruiting processes and evolve and optimize their company cultures. Startups and venture investing is all about the people. We’ve known that for years and now we’re finally putting real resources behind making a difference. Adam has already improved our team. We can’t wait to watch him improve the teams – and as a result the performance – of our companies. We spent a lot of time in 2013 working to rethink our business model and our relationship with the market in which we operate and the companies with whom we partner. We’ve been working hard to raise the bar on our expectations for ourselves as it relates to serving our customers – the companies in which we invest and the whole community. At a fundamental level, we define ourselves by a belief that we’re in the customer service business, serving both our Limited Partner (the legal term for investors in VC funds) and founder customers. As part of that, we’re striving to provide the best experience to the founding teams we work with. That means not only delivering real impact after we invest, but also providing the best possible experience on the front end, including for founders that we don’t end up partnering with. Like most investors, we compel the founders of our portfolio companies to actively solicit and listen to customer feedback. We understand and preach a belief that being customer-centric is a good idea for all of our portfolio companies. Hardly an earth-shattering notion, of course. But as we thought about it, we realized we weren’t sure that we did a good job ourselves at being customer-centric. With that in mind, we decided to eat our own dog food and ask the market how we were doing. 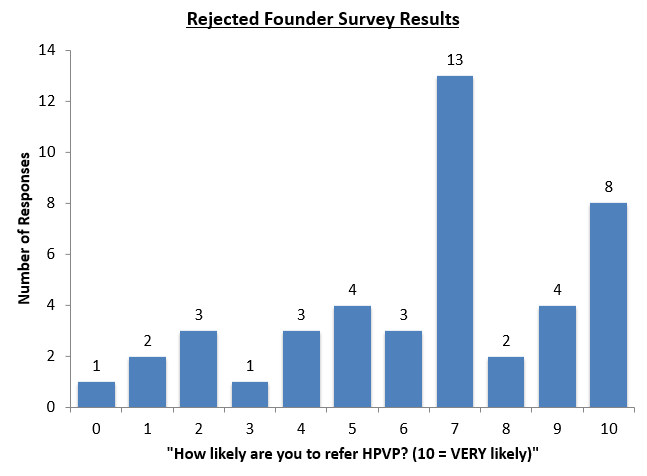 So last month, we surveyed every founder that pitched us over the course of 2013 and did not receive an investment offer from us. Admittedly, we weren’t sure what to expect, as we figured these founders were likely to skew disgruntled. We did after all decide not to invest in their companies, suggesting to these proud parents that their babies were at least a little bit ugly. The good news is that we got a high response rate and learned a lot about how to improve. We used a standard called Net Promoter Score (NPS) as a guide, in which customers are asked one simple question: how likely they would be to refer a given company they had interacted with to a friend. In the NPS world, 7 or higher is where you want to be, and below 5 is pretty bad. How’d we do? We need to be more clear about the stage in which we invest – some founders came into a meeting thinking we might lead a large Series A round (we don’t). We need to make our pitch review process more efficient – some founders were frustrated at being asked to do multiple ‘first meetings’ as we tried to get the deal in front of the right High Peaks team members. We need to be consistent about providing more feedback when we elect to pass – clearly we are guilty of the unexplained pass at times. We’ve changed the language on our website to emphasize the fact that we focus primarily on Seed stage investments, and we’re doing more pre-screening of deals before inviting people in. We’ve restructured our deal team more clearly into two divisions, one focusing on B2B and one on ecommerce, to create a clear and efficient opportunity escalation process. We’ve committed internally to taking more time for follow-up phone calls and emails when we pass. We’ve got a lot more to learn and a lot of work to do – this surely will not lead us to 80% 7+ scores next year. But we’re living a never-ending pursuit of excellence, and we’re going to try. And most importantly, we’re going to be listening a lot more. For those founders who meet with us this year, we hope you’ll keep us honest. Seed stage capital is a commodity. AngelList, the seed funding boom, the rise of the MicroVC and any number of other phenomena are ensuring this. And entrepreneurs are getting smart about it. Historically, the seed stage VC game has centered around simply picking companies. Actually helping them to operate – and by that I mean really, genuinely impacting operations, is an afterthought. With only a few exceptions, investing in genuine operational support for portfolio companies is written off because resources are limited at smaller funds and incentives and human nature lead to a focus on hunting down the next deal. 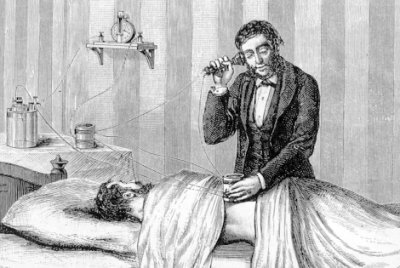 As a result, most seed stage investors remind us of seventeenth century physicians – the one-stop-shop for all your medical needs who was a jack of all ailments, but master of none. That physician of old would deal with whatever walked in the door – broken bones, the plague, a burst appendix, or a premature birth – and know that he was the last line of defense. He knew what he knew, made up the rest, and hoped for the best, as he was the only option around. Sound familiar? That’s the classic seed stage VC – a tiny bit smart about a lot, but woefully ill-equipped to have any real impact on most operational issues. Trust me, I know…I spent too many years living this model myself. At High Peaks, we are working hard to re-think the seed stage venture model. Our goal is to be less Renaissance era doc and more 21st century, big city general practitioner. We think we’re pretty damn good at what we do, but we know we don’t have the experience to go all that deep on most tactical issues. Fortunately, unlike many, we don’t try to, either. Rather, we excel at preventive care (helping the teams we work with to see the forest and think constantly about goals, metrics, and the ecosystems in which they operate) and stay engaged enough to work with CEOs to diagnose operational issues early. Increasingly, then, we refer out to a true specialist. To that end, today we’re excited to formally announce the start of our family of “specialists”, the High Peaks Operating Partner Network (“OPN”). The OPN is a collection of incredibly successful operators and, importantly, tactical experts. Hailing from leading NYC companies like Seamless, Gilt, SinglePlatform, Quidsi, and Medidata, these operators have, collectively amongst them, deep knowledge in just about every functional area that our SaaS and Ecommerce companies wrestle with. When a portfolio company has symptoms that need to be addressed, they’re on call, capable of suggesting a remedy and often available to advise the company on an extended basis. Unlike the classic Advisory Board model, which gets the biggest, sexiest, most impressive CEO names possible and then puts them on a website while they never contribute much (yep, we’ve been guilty of that one! ), we’re focused on true expertise in critical functional areas – the folks who are actually doing the dirty work in areas like inside sales operations, search engine optimization, account management, etc. These folks know their stuff, and our companies are reaping the benefits of that expertise by working with them. We are singularly focused on continuing to build a platform of operational assets that will support entrepreneurs. The OPN (have a look at our initial group here) is the first piece of a puzzle on which we will be sharing more details in the coming months. Stay tuned. 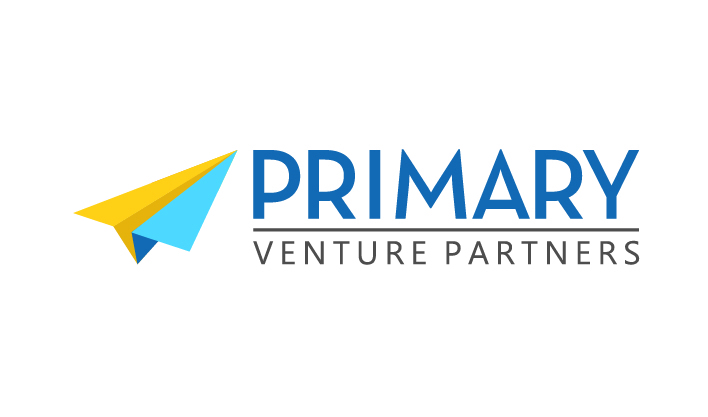 Brad Svrluga is an early-stage VC; co-founder and Managing Director at Primary Venture Partners. Click my picture if you want to learn more.